Oh 4 peats sake what have I gotten my self into! Explore the many sides of me. I am sure that you have all seen this recipe floating around on Pinterest. I know because that is how I found it. You know the one that says my husband asked me to make this 5 times while he was eating it. I am always skeptical of things that explode all over Facebook or Pinterest but decided to give this a try. I was pleasantly surprised that this recipe was amazing. Might have been a bit to spicy for the kids but my husband and I loved it. You can find this recipe over at kevin & amanda. It also tasted great the next day as leftovers, always a plus in my book. 1. Add olive oil a large skillet over medium high heat until just smoking. Add sausage and onions and cook until lightly browned, about 4 minutes. Add garlic and cook until fragrant, about 30 seconds. 2. Add broth, Ro-Tel, cream, pasta, salt and pepper and stir. Bring to a boil, cover skillet, and reduce heat to medium-low. Simmer until pasta is tender, about 15 minutes. 3. Remove skillet from heat and stir in Jack cheese. Top with scallions and serve. If you kids are like mine then they love Macaroni & Cheese. I am not the biggest fan of the boxed version because I don’t really like the consistency and lets be honest have you read the ingredient list. There are some things that I am not really sure what they are and how they pertain to food. So I prefer to make mine homemade. 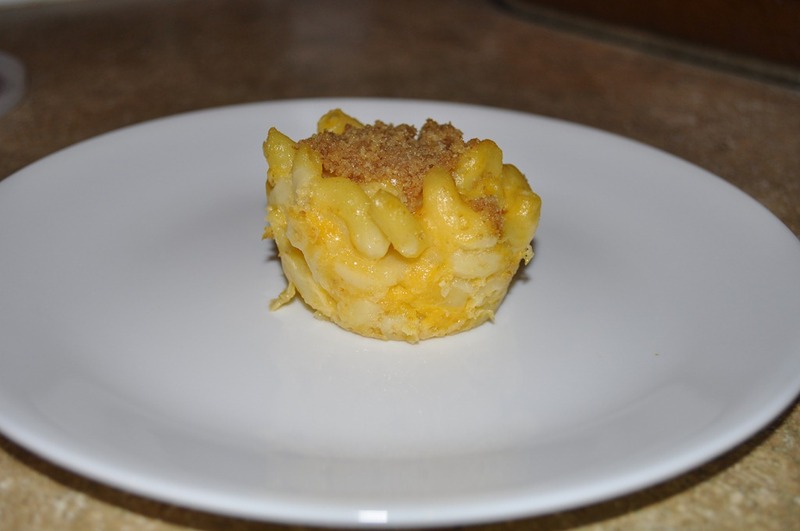 I stumbled upon an article that talked about making mac n’ cheese appetizers in mini muffin pans. I thought that sounded like such a fun way to make dinner for the kids. I used a regular muffin pan instead so that the portions were bigger than a bite. Such a fun side dish and the cayenne gives it just the right amount of kick. 1. Bring salted water to a rolling boil and cook pasta according to package directions. Cook until soft. Don’t stop at al dente, the pasta will not continue to cook through when molded into muffin form. 2. Make cheese sauce by melting 3 Tbsp. butter and mixing in the flour. Cook the butter and flour together for a few minutes to cook out the raw flour taste. Slowly add the milk and whisk in. Continue to whisk until sauce thickens. When sauce thickens remove from heat and add grated cheese. Season with salt and cayenne. Add sauce to the cooked pasta. Then add 1/2 cup of bread crumbs and eggs. Stir the mixture. 3. Melt the remaining 3 Tbsp. of butter and blend in with the 1/4 cup of bread crumbs. Set bread crumb mixture aside. 4. Preheat oven to 350 F. Liberally grease muffin tins. Spoon the mac n’ cheese mixture into the muffin tins. Garnish with bread crumb mixture and bake for about 20 minutes or until browned on top and somewhat firm to the touch. Cool for about 15 minutes before removing them. If you have trouble removing them cool for a bit longer. I found this recipe over at Picky Palate and thought I would give it a try. 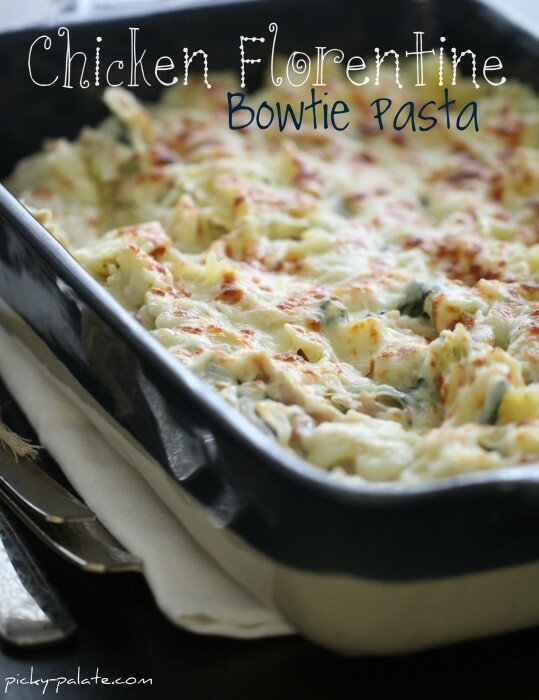 This Chicken Florentine Bowtie Pasta is a great weeknight dinner that didn’t take much time to put together. To make it even similar grab a rotisserie chicken from your local supermarket and use the chicken off of that. Plus it made enough for our family to have it for leftovers the next night as well. The other thing that I love about this recipe is that I was able to sneak in some spinach. My kids gobbled it right up never knowing they were getting something extra! 1. Preheat oven to 350o F. Spray a 9 x 13 inch baking dish with cooking spray. 2. Place oil in a large skillet over medium hear. Add onion and cook, stirring until tender, about 5 minutes. Add garlic and cook, stirring for 1 minute. Stir in spinach leaves, cook, stirring until wilted about 2 minutes. Add chicken, salt, and pepper, and cook until heated through, about 3 minutes. Add cooking cream, stirring to combine. 3. Cook pasta according to package directions, drain and run under cold water to stop cooking. Add pasta to chicken mixture stirring to combine. Transfer to prepared baking dish and top with cheese. 4. Bake for 20 to 30 minutes, until cheese is melted. 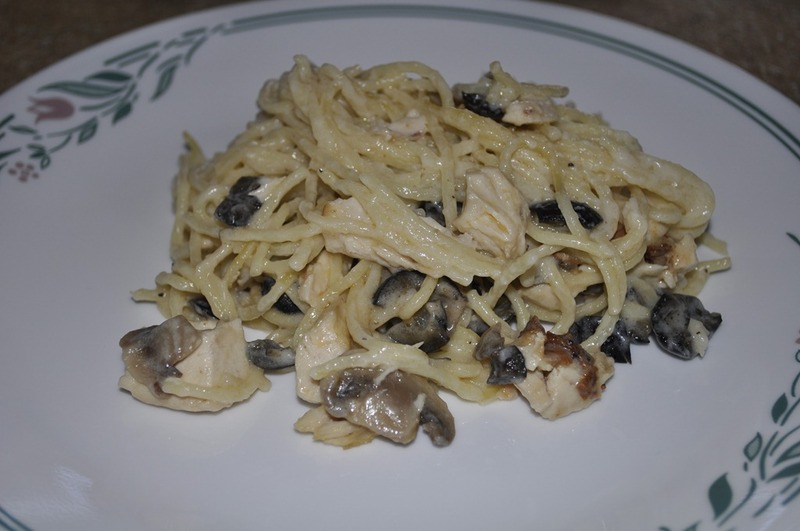 I’m back again and with a great recipe that will feed an army or at least a large family. I adapted this recipe from The Pioneer Woman and it was a wonderful. The mushrooms are cooked down in a little white wine and they had an amazing taste. 1. Melt 2 Tbsp. butter in a large skillet. Add mushrooms, 1/4 cup white wine, and sprinkle with salt and pepper. Cook over medium heat for 8 to 10 minutes, or until liquid has totally evaporated. Remove mushrooms from skillet. Set aside. 2. Bring water to a boil. Break spaghetti into thirds or shorter pieces. Add spaghetti pieces to boiling water and cook. Drain when al dente. 3. Remove meat from bones and cut up until you have 2-plus cups of shredded chicken. 4. Return large skillet to medium-low heat. Add 6 Tbsp. butter. Sprinkle flour over butter, whisking to combine. Cook for 1 or 2 minutes. Pour in 2 cups broth and whisk to combine. Pour in milk, additional 1/4 cup wine, salt and pepper to taste, then cook and bubble until thick. Turn off heat, add Parmesan cheese, and stir. 5. Add mushrooms, chicken, and chopped olives. Stir to combine and check seasonings. Add cooked spaghetti and stir. Turn into a 9 x 13 casserole pan. Bake at 350o F or until golden brown and bubbly. Squeeze Santa’s Cheeks for a Kiss . . .